In another 15 days my baby is turning 5. B4 will become B5. Goodness gracious me. This year is absolutely flying by. And here we are at our fifth cook-a-long…already! This month I really umm’d and aahh’d about which recipe to choose. I even “phoned a friend” (thanks Denica!) to get a second opinion, so I really hope you enjoy the recipe I (we) have chosen. The recipe this month is Pork Schnitzel with apple salad. Something to keep the carnivores in our lives happy. Full details for the August cook-a-long can be found here. Don’t forget to mark Wednesday 21 August in your calendar and invite your friends. Once you are finished cooking, take a moment and capture a photo of your meal. Post your picture and comments on the My Delicious Year Facebook page or share it on instagram using the hashtag #cookalong and tag @mydeliciousyear. If you have any themes, cuisine’s or key ingredients you would like to see in future cook-a-long’s, make sure you either leave a comment below for me or send me a message through the Facebook page. I love to hear from you guys. Well here I am on the 12th of July posting the July cook-a-long recipe. Goodness me! Slack hey? So the theme for this month is “keep it simple”. This month’s recipe is a very simple Savoury Lamb Pie. If you would like to take it to the next step, have a go at making your own shortcrust pastry. All the details for the July cook-a-long can be found here. Don’t forget to mark Wednesday 17 July in your calendar and invite your friends. Sufferin’ succotash, we’re eating succotash! 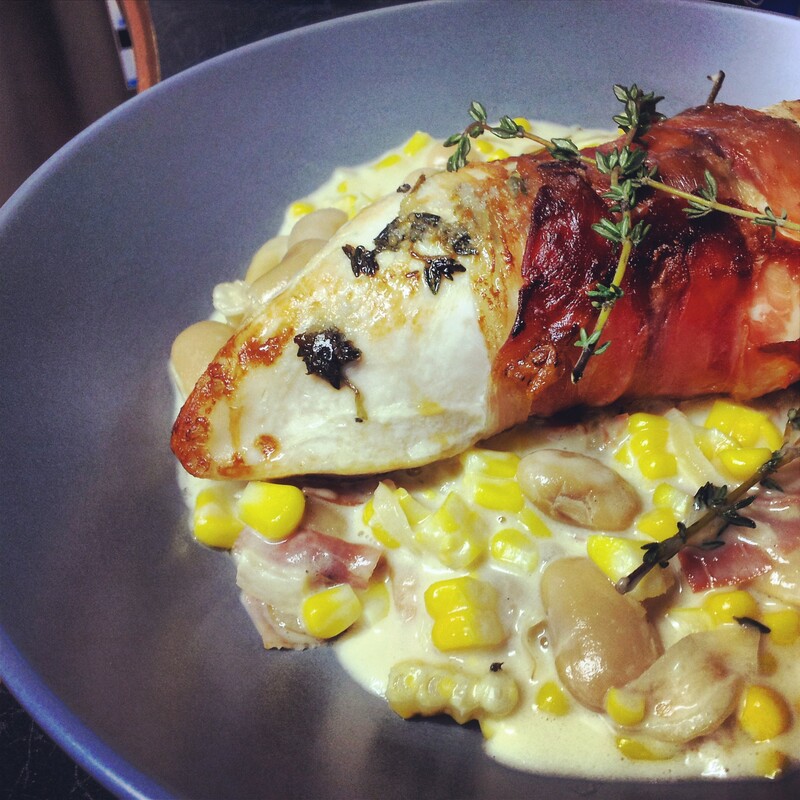 When I saw the recipe for Bacon-wrapped chicken with succotash I immediately thought of watching Looney Tunes as a child and Sylvester spluttering all over the place “Sufferin’ Succotash”. Succotash is no meal to suffer over though. It’s a frugal combination of beans, corn and bacon brought together with a dash of cream. For a quick, tasty, mid-week dinner you can’t go past this recipe. And if you’re like me, you’ll probably find most of the ingredients already in your pantry or fridge.